Kino can be very persuasive. Kino no Tabi, given the English name Kino's Journey: The Beautiful World, is a Light Novel series by Keiichi Sigsawa which was adapted into a fourteen-episode anime series and an OVA. It follows the travels of a teenager named Kino and a talking motorcycle named Hermes as they travel from country to country. Each land they visit contains unique and eccentric peoples and customs, sometimes helpful and sometimes dangerous. Kino's world isn't kind, though, and any viewer faces slavery, cannibalism, execution, and homicide both justifiable and not for every flying machine, beautiful city or pastoral wilderness. While Kino often refuses to make judgments on any country, a combination of a fast weapon draw, quick wits and a steadfast rule to stay in no country longer than three days and two nights all keep Kino going. See also Allison and Lillia, a more lighthearted action-adventure series from the same author-illustrator team. Compare Shoulder a Coffin Kuro. See Gakuen Kino for the High School AU. Adaptation Dye Job: Kino's hair, jacket, pants and eye color were all changed for the anime adaption. Adventure Towns: Though frequently subverted when Kino passes through without affecting anything. Ambiguous Gender: Kino is a girl. The anime and the original novels don't reveal this until late in their tellings. The first episode, where possible romance with a male character is mentioned, is a tip-off, though it's barely noticeable. Ancient Tradition: Played straight a few times, then Lampshaded in one episode, where the citizens of one country continually make up new, ridiculous traditions for travelers, though Kino points out that pranking the tourists might actually be this country's tradition. Hermes the Talking Motorcycle complains that Riku the Talking Dog shouldn't exist. Kino's skepticism about the possibility of humanoid robots, despite traveling with a sentient, mechanic companion, and having seen many kinds of sophisticated robots along the way. Art Evolution: Being a series that's over a decade long, it's pretty staggering. It also explains why the anime Kino looks so childlike compared to the illustration in the recent novels, since the early novels had a much 'rounder' artstyle. The Atoner: An unnamed man that Kino once met, referenced in a flashback is this. He killed a man, and afterwards regretted it and became a bodyguard to his widow, following her to the ends of the earth and protecting her from any danger. Author Appeal: Keiichi Sigsawa appears obsessed with minutiae of all sorts of technology, judging by the overly-detailed descriptions of all weapons and vehicles that appear, plot-centric or not. Even his pen name is based on a gun brand. He also has the tendency to write some of the weirdest postscripts to exist. Barehanded Blade Block: Subverted, as Kino wears metal wrist guards. Beware the Nice Ones: Kino is a very polite, non-judgemental, and often generous character, who does not seem to take any pleasure in fighting, even if it's the only option. Someone delivering a threat, though, will be dead before they know what's going on. Bokukko / Tomboy: Kino, but only in the anime adaptations. Bottomless Magazines: Kino's guns seem to have them...sometimes. The anime's better about keeping gun capacity in mind. Bowdlerise: While the anime adaption is largely faithful to the novels, most of the violence was toned down, and some of the characters that Kino meets or the countries Kino visits are portrayed as much more sympathetic. The first film, Life Goes On was much more offending in this regard. Broken Aesop: Happens most times when Shizu tries to help other people. Boyish Short Hair: Kino. It helps disguise her gender. But for Me It Was Tuesday: When Shizu and Kino meet each other again, Shizu is ecstatic to meet Kino again, as Kino was the one who saved his life. However, Kino is apathetic to their reunion, and even has trouble remembering Shizu's name. Captain Ersatz: In the "coliseum" episode, Kino fights knockoffs of Batman, Clint Eastwood and Luke Skywalker. To be fair to the creator, this wasn't so in the original novel where the fights were only briefly described. Character Gender Confusion: King Yukio, somewhat. And Kino herself (overlapping with Viewer Gender Confusion), as she's mistaken for a boy several times in the anime. Her character design in the novels is noticeably more feminine. Chekhov's Gunman: The old man in the Kind Land who gives Kino the Woodsman was actually Master's partner/student and they traveled together in the past. He is a main character in the novels, appearing during the flashback journeys of Master. City of Canals: The Sad Country. Crap Saccharine World: Kino's home country, the Land of Adults, is a place where people over twelve get a brain operation that allows them to be happy while performing any task. Thus, nobody is ever unhappy at their job... or at anything else... including state-sanctioned murder. Questioning this system is the only thing that seems to make them angry. Continuity Nod: Lots of these, especially in the novels. Combat Pragmatist: Kino, who even goes as far as to use the decapitated head of an enemy's comrade as bait once. Kino also uses a gun in what was supposed to be a knife duel in a lesson during training with Shishou. Computer Equals Tapedrive: In keeping with the eclectic technology of the series. Crazy Prepared: Kino throughly maintains the Woodsman and the Cannon every night, gets up at the crack of the dawn to practice shooting, and always carries two guns and many, many knives, and a gun disguised as a knife, just in case. Cruel Twist Ending: In the novels, many of the stories are cruel enough to make the viewer suffer their own BSOD. Decade Dissonance: In most cases it's best to think of the different countries as existing in separate universes. Handwaved, in that travel between towns is dangerous and rare, and few individuals could ever imagine leaving their town. Enfante Terrible: Several characters, and arguably, Kino. The Evil Prince: King Yukio. Extended Disarming: Kino, when being held at gunpoint by some slavers, drops many, many knives. This leads one of the slavers to remark, "Are you a knife merchant?!" Fan Service: Nimya in the "Land of Wizards" episode; it's the only time it really shows up in the anime. Also played straight in some of the illustrations. The High School AU spinoff Gakuen Kino is basically a fanservice series. The Farmer and the Viper: The trio of slavers aided by Kino before she knows their profession. Getting Smilies Painted on Your Soul: Kino's hometown does this via an operation on everyones's brain before they become adults. She just barely escapes the same fate. Go Out with a Smile: King Yukio's reaction to a rocket-propelled grenade being launched at him is to grin eagerly, as if being presented with his heart's desire. Gratuitous German: Hermes is called a motorrad throughout the series. "Motorrad" is the German term for "motorcycle". Kino's name is also German for 'theater'. I Call It Vera: All of Kino's guns are named. "The Woodsman" is a .22 Colt Woodsman Match Target semiautomatic pistol; named after Kino shot off a branch to take out a bandit/the gun's real-life counterpart. "The Cannon" is a .44 Colt 1851 Navy single action revolver that takes liquid explosives instead of gunpowder; it's named after what it can do. Later in the novels Kino acquires "The Flute"; a Arisaka type 99 bolt-action sniper rifle. Emotionless Girl: Master/Shishou when she was young. She does mellow out and become much kinder by the time she teaches Kino how to 'persuade' (fighting) though. Implausible Fencing Powers: Shizu, in the Colosseum episodes, repeatedly blocks bullets with his sword. Apparently he's just that good at telling where his opponents are aiming. Important Haircut: Kino's hair was cut into its current style after it was stained with blood from the first person she killed. It Gets Easier: Kino, Shizu and especially Master have killed so many people they don't even feel remorse anymore. When minor characters call them out for murdering so casually, they reply with I Did What I Had to Do. Knife Nut: Kino is nearly always shown to buy knives when visiting shops, sometimes only because they look 'pretty'. Knight in Sour Armor: Shizu. Land of One City: Most countries Kino visits consist of 1 city. Lethal Chef: Kino is apparently a terrible cook. When the doctor in volume 7 says that the cooking was delicious, Kino is visibly surprised, remarking that that was the only time someone said that with a straight face. While they were training together, Shishou was so terrified of Kino's food that she wouldn't let her cook. Kino in the first years living with Master. Mind Screw: The Land of Books episode, especially at its end, when it's suggested that Kino is just a character in a book which is itself part of a virtual reality simulation cooked up by the last man on earth to entertain his daughter...or maybe that guy was just crazy. Not So Stoic: Kino reveals herself to be this at the end of the final episode of the anime series. No Export for You: Tokyo Pop released the first of the books, but unfortunately hasn't released any of the others to date, with no word as to whether they ever will. Hermes: (in response to Kino being forced to disarm to enter a country) This is still better than that time when you had to wear those weird clothes to get in. Kino: ...I don't even want to think about that anymore. No Name Given: Master/Shishou and her partner have no given names. Instead, Shishou is referred to as 'the woman' or described as 'the beautiful woman with long hair'. Her student is referred to as 'the man' or described as 'the slightly short but handsome man'. Not So Different: Two countries that are at "war" formed a truce so that instead of fighting each other, they make a sport of slaughtering the civilian population of a third country. The victims in turn "fight back", by capturing clueless travelers and brutally killing them, invoking very similar arguments as the other two did. It looks like the only reason they are the ones getting slaughtered is because they just don't happen to have a military. Offing the Offspring: In Kino's home country, any child that doesn't submit to a medical procedure similar to a lobotomy and brainwashing at the appropriate age is killed. One-Man Army: Kino and Master. Kino singlehandedly kills an entire band of war veterans and mercenaries in a few chapters, but Master is even more impressive as she takes out hundreds of people all in one chapter. Only One Name: We never do learn most of the characters' full names, including Kino's. Parental Abandonment: Kino. Well, Parental Attempted Murder, at any rate. Percussive Maintenance: When Hermes says embarrassing things, or just acts like a total jerk, Kino usually shuts him up like this. Pinned Down: In the Land of Heroes, while fighting 7 veterans, Kino does this with a sniper rifle. The end results are a man losing several limbs and another having half of his head blown off. Planet of Hats: Elevates this trope to an artform. Pronoun Trouble: Kino's gender remains obscured for the first three episodes due to this. Weirdly enough, she is almost always recognized as being female right away after that. The novels elegantly avoid the problem by being in Japanese, which has gendered pronouns but hardly ever uses them. Translation, however, presents difficulties. Ridiculously Human Robot: Subverted. She's actually human, and an inventor, who started believing she was a robot after a severe trauma. The actual robots are VERY obviously non-human. Samus Is a Girl: So is Kino. Schizo-Tech: Not just between country to country, but even within the same country. A place might have both psychic nanotech and cobblestone streets and typewriters and phonographs and talking robots, while another country has hoversleds and tape-based computers. The titular character's equipment includes a racing motorcycle made between 1929 and 1940, a pistol from 1947 to 1955, a revolver from 1851, and a rifle that comes from the 1930s. Screw This, I'm Outta Here: Kino is pretty much the master of this trope. Self-Deprecation: "Sane people don't become writers, Hermes." 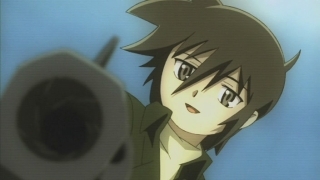 Shoot the Dog: Kino has to do this several times, and several stories revolve around this idea. In the preview for episode 9, Hermes asks Kino what she would do if she had a typewriter that was a talking cockroach. And Episode 9's subtitle, "Nothing Is Written", and opening in the desert, may be references to Lawrence of Arabia. In the episode "Her Journey", a king offers a boon to an old man, whose only request is that the king move out of the way of the sun. This is a common folklore attributed to several philosophers and mathematicians. Also, the alleged wise hermit was part of country's experiment with The Ludovico Technique. As in A Clockwork Orange, it ended very badly for him. Sink or Swim Mentor: Kino's "Master", in the first movie, in the series' usual brutal, understated fashion. Steampunk: Several countries have this distinct feel to them. The Stoic: Kino is often (though not always) portrayed as being this. Telepathy: One country has developed a concoction that would allow citizens who drink it to read the minds of others who also drank it. Then they forced everybody in the country to drink it. This turned out badly. Three Kinds of Science Fiction: The Land of Wizards episode is the gadget variety. Too Dumb to Live: A country Kino encounters in episode 5 was ruled by majority rule, and began to kill off the minority voters. Eventually only two people were left alive because of it. Try Not to Die: An important rule for all travelers. Untranslated Title: The first novel was released in English under the title "Kino No Tabi". Then again, this isn't the first time Tokyo Pop has had these kind of problems. Vague Age: Kino is 12 when beginning training with Shishou, but other than that no age is revealed. The woman who voices Kino in the English dub is just a circumstance of the casting; it's implied that Kino is meant to be 11-12 during the flashbacks, and around 15 for the rest of the series. Averted in the novels as it's stated in volume 10 that Kino started traveling 'three years after her 12th birthday', meaning that Kino left Shishou at the age of 15. However, it's insinuated that several years had passed since she started traveling. Walking the Earth: The premise of the series. Whole-Episode Flashback: Episode 4. Also, episode 13 is either this or Anachronic Order, since it takes place before episode 1. Yamato Nadeshiko: Naturally, there's one when Kino stays in Japan. You Can't Go Home Again: Kino and Shizu. Further enforced since it's implied that she did go back to her home country once more -- only to find it in a complete ruins. You Don't Look Like You: Kino's appearance in the anime is quite different from the descriptions and illustrations in the novels. In addition to having a different hairstyle and eye color, wearing differently colored clothes and being much taller, she is noticeably more feminine in the novels. Your Head Asplode: In Episode 7 when Kino shoots the king. It also happens quite frequently in the novels, and is described quite graphically. This page was last edited on 31 May 2015, at 03:11.